The Farm Hand Carts website was hacked last summer and somehow I still haven’t managed to revive it. In the meantime I keep getting requests for the plans for how to build your own that I used to have there and it’s a shame that they’re not still up so I figured I’d post a quick version here until I can get around to restoring all of the information from the old site. 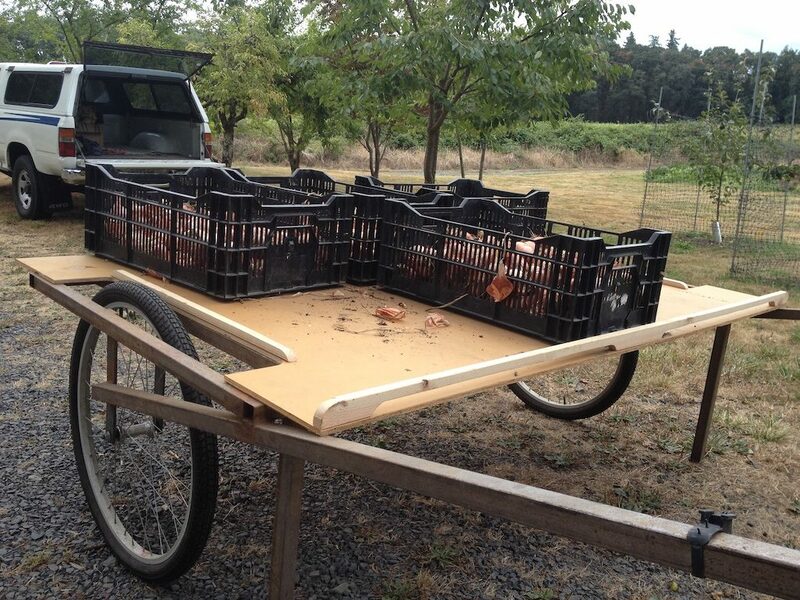 A photo showing the cart with a simple plywood flat bed with some cleats on the edges to keep it the bins from sliding off the edges. A flat bed like this is very effective for most situations and very easy to load. It lifts off for cleaning, or storage and is held in place by stiffening cleats (see photo below). 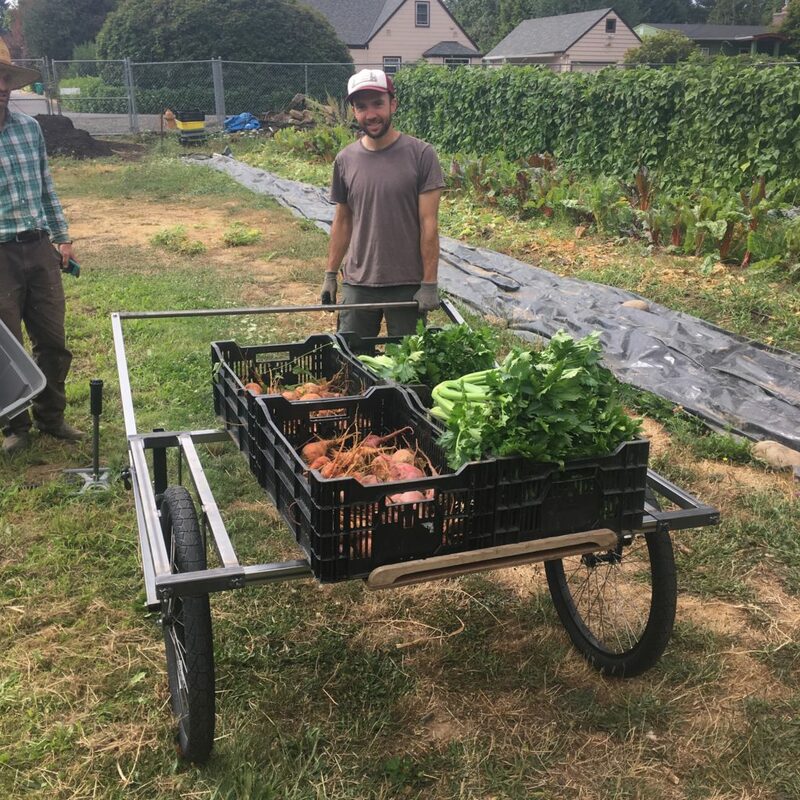 One of the features of the cart is that as a simple frame you can have multiple platforms that simply sit on the frame – for example different beds for harvest and for hauling compost. I also make tools like rolling bed markers that go onto the frame. The basic drawing, with dimensions, for the cart pictured above is linked to here. You can change any of the dimensions to match your farm – the two I suggest considering changing are the handle height and the space between the wheels (width of the cart). I set the handle height by measuring the distance to the ground from the tips of my fingers when I’m standing straight up. I want the handle just a few inches below that so I don’t have to bend over much to pick up the handle. For the width of the cart I set the distance between the centers of the wheels to match the distance between the centers of my planting beds. I don’t recommend changing the bed height much, but many people do. For hauling, the cart frame is designed to support a 48″ flat bed, measured from the front of the cart to the back. It should overhang the frame evenly on the front and back of the frame to create good balance and support for the plywood. I make the carts out of 1 1/4 x .065 square tube and 1″ round tube with a similar wall thickness. The fork legs are 1 1/4 x .25 flat stock. It’s overbuilt, but the added stiffness from being overbuilt makes it easier to move and it’s not excessively heavy. 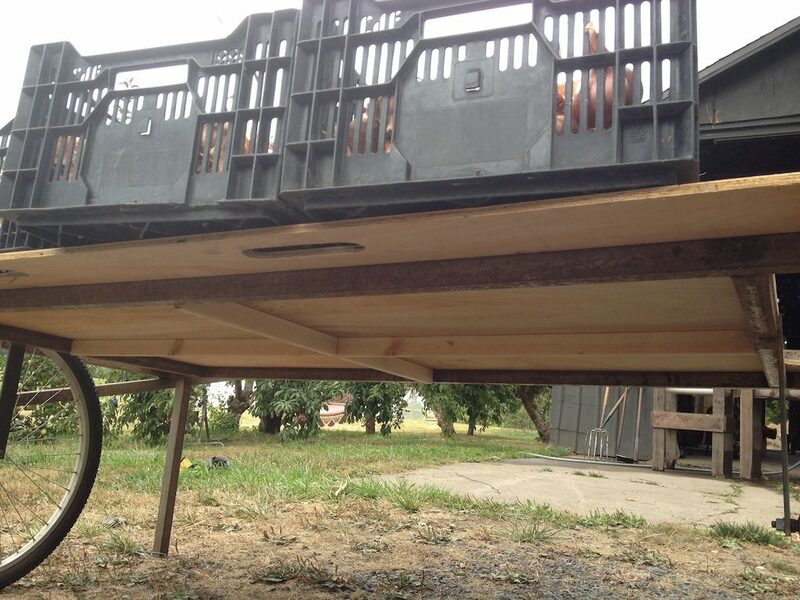 Here’s a photo from the underside of the cart showing the stiffening cleats that hold the flatbed on. You can also see how the plywood overhangs the frame. Cutting a handle in the flat bed makes it easier to remove for cleaning and storage and to move around when it’s not on the cart. This flatbed is actually mounted opposite of the direction I usually would put it on – I like to have the cleat that keeps the bins from sliding off in the back, away from the handle. The cart is easier to push than to pull in most situations. The cart is designed to be used with standard 26″ mountain bike wheels that are commonly available. Yes, the wheels stick up a little over the frame but I don’t find that they get in my way and the bed of the cart sits just right for easy loading, but still having plenty of clearance. 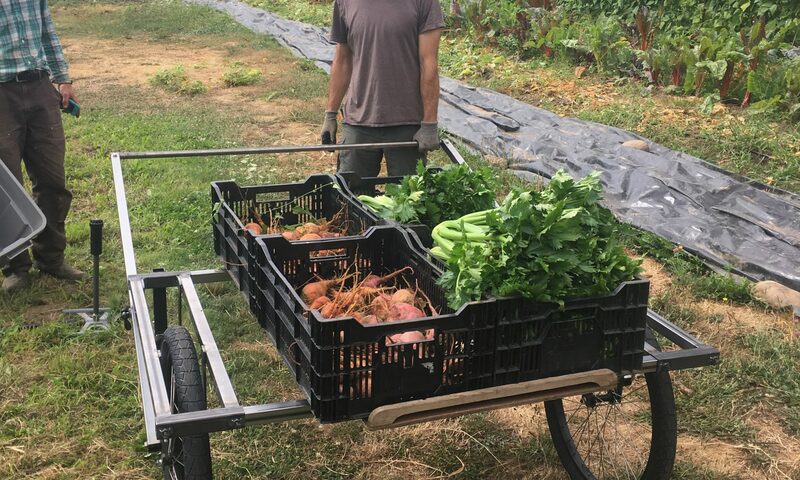 I double and triple stack bins on this cart and have no trouble moving it unless it’s over loaded (more than 300-400 pounds). The weakest link on the cart is the wheels. They tend to buckle under very heavy load when the cart is going around a turn. Don’t overload the cart and they’ll be fine. If you do overload the cart, make sure the wheels are rolling in a straight line and aren’t getting much side loading (from going over big bumps, or going around turns quickly). If they do break, they’re easier and less expensive to replace than the cart frame itself. This is a pretty simple welding project for learning on. There’s not a lot of cutting either. Have fun with it and I always love seeing photos of carts in action out there so if you build one please let me know and send me a photo. Thanks! This is a photo of a slightly fancier adjustable cart that can be broken down flat, but it’s pretty much the same thing as the one above. It has a very undersized flat bed on it (we were just playing around here). This is one of the only photos I have with a person using one (Hi, Martin!) and it gives a little better sense of the scale. This particular cart is set with 4′ between the wheels. I’ve made had two runs of these made and there are about 15 or 20 of them out there on farms around the country that I’ve sold. I may build another run at some point. I know there are many more farm built versions from the plans above because I get emails from folks all over the world who have built them for themselves. Corn and Beans for Sale! I’ve made a new page for crop sales here – but I’m also posting all of the information here, just below. If you’re interested in getting a little corn read on and order soon, quantities available are quite small. Clockwise from the top: Piatella, Dakota Black raw and popped, Otto File, Pigna, Tolosaka, and in the center is Sorana. 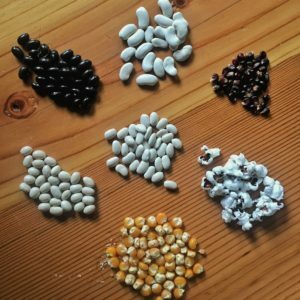 UPDATE 12/13 – Less than 24 hours after posting this I’m sold out of the popcorn and Pigna beans but we still have a small quantity of the Tolosaka, Piatella and Sorana beans available, and plenty of Otto File corn. If you already ordered I’ll be sending order confirmations this afternoon. Thanks for all the orders and keep ’em coming! The 2018 crop of Dakota Black popcorn and a small offering of dry beans is up for sale for a limited window, and I also have some remaining Otto File polenta corn from the 2017 season. These were all grown at Cully Neighborhood Farm in NE Portland. $6 a bag (2 cups of whole kernels, a bit more than ¾ pound) – Most of this went to our CSA at Cully Neighborhood Farm this year but we had a number of odd shaped ears with perfectly good kernels on them so I shelled those and I’m offering them here. I just popped a batch yesterday and it continues to be excellent with a high percentage of popped kernels that come out medium sized, bright white and with great fresh popcorn flavor, not at all like the big stale stuff you get in most bulk bins. $4 a bag (2 cups of whole kernels, a bit more than ¾ pound) – A few years ago I was in Italy and visited a wonderful little biodyanamic market farm in Lucca. The farmer gave me an ear of his golden polenta corn (otto file, meaning eight rows in english – because there are eight rows of kernels on the slender cobs). I ended up planting it in my garden and it made amazing polenta – tons of corn flavor, beautiful golden color, slightly sweet – so I grew more. I use a relatively simple Corona hand mill to grind mine as I need it, but there are many other options out there. It can also be cooked whole. This is my name for the tolosa black bean, which I’ve been growing since 2007. This is a beautiful, large, deeply black bean that is from the Basque region of Spain. Look it up, apparently it’s famous. I just know it’s delicious and one of my favorites. A great little white bean, very tender and tasty. Lane Selman and I brought this back from Italy by request for Uprising Seeds in 2014 and they shared seeds from their first grow out with me the following year. I’ve been growing it for the past two seasons and it’s quickly becoming a favorite for its great flavor. It’s a Slow Food Ark variety and you might try to find it from the Italian growers if you really like it and support their efforts to keep it growing in it’s traditional areas. Quantities are extra limited for this flat, white bean. I got this one from a grower in Italy who also uses corn for trellising. 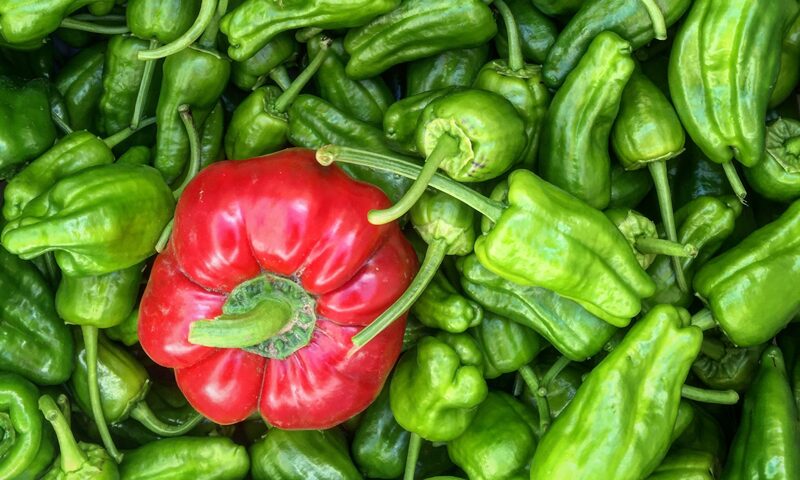 It’s a Slow Food Ark variety and you might try to find it from the Italian growers if you really like it and support their efforts to keep it growing in it’s traditional areas. All orders are packed here in the St. Johns neighborhood of Portland, OR and are available for pick up on my porch. To order Send me an email (by clicking on “send me an email”) with your order including the items you’d like and the quantities. I’ll send you the details for the pick up location, how to pay, and when your order will be ready (usually in a day or two). I’ll be packing orders through December 21, 2018 before taking a break for the holidays, or until I sell out.